Utility workers provide us with vital electric, gas, and other services on a daily basis, but many of us are unaware of the hazards they face when performing daily routine tasks and dealing with emergencies, such as power outages and gas leaks. These dangers can lead to chronic disabling conditions and catastrophic injuries. Under Georgia law, injured utility workers may be entitled to workers’ compensation benefits for medical care and lost wages. Utility workers often deal with electrical problems at residences, businesses, factories, and other locations. They are often working near dangerous live electrical lines. If an accident occurs, they can suffer electrocution or electrical burns. Utility employees must work on older buildings and power stations that were constructed before the dangers of asbestos and other toxic substances were known. In addition, they can be exposed to toxic chemicals when working near explosions or fires. Exposure to these dangerous substances can lead workers to develop cancers and occupational illnesses—sometimes life-threatening. Power outages and other utility emergencies often occur when the weather is extreme. Even on a routine day, utility workers are exposed to excess heat and extreme cold. As a result, they can suffer serious weather-related injuries, such as heat stroke, dehydration, frostbite, and hypothermia. When utilities are buried in trenches or tunnels, employees can be seriously injured or killed if the trench or tunnel collapses as they are working in it. Many people must work from heights when making repairs on or near power lines and risk suffering life-altering injuries in a fall. Even performing duties on the ground can be dangerous when the ground is slippery due to weather or other conditions or there are fall hazards in the buildings and homes they are working in. Performing the same movements repeatedly and using power tools that vibrate can lead to repetitive stress injuries to the wrists, knees, elbows, and hands. Due to the physical demands and long hours associated with utility jobs, overexertion injuries, like muscle tears, strains, and other injuries, also are common. 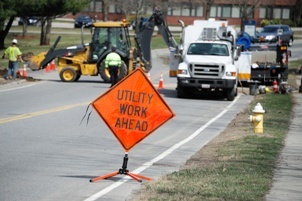 Because utility workers must travel between job sites, they are at greater risk of being injured or killed in a motor vehicle accident caused by a negligent driver. They may be able to pursue a claim against this at-fault motorist as well as filing a workers’ compensation claim.